Recognizing between major and minor is an important basic skill for any musician. It’s one of the first steps that allow you to really dig into the music and understand how it’s made. I get this question quite often so let’s dive right in. How do you tell if a song or a piece is major or minor? There are two ways to tell whether a song is major or minor: by ear and by sight. When doing it by ear, listen to the major vs. minor qualities in the music. When reading the sheet music, the answer is in the key signature and in how notes and chords are used. That sounds simple enough but it does take some practice so let’s look at the details. We’ll discuss first how to recognize major and minor by reading the notation and then recognizing major and minor by ear. In this article we’re going to examine where keys come from as well. I suggest you read it once even if you’re familiar with key signatures and scales. Understanding where they come from makes this whole process much easier! The Key Signature: Is it Major or Minor? Where do Key Signatures come from? So is it Major or Minor? We’ll begin with recognizing a major or minor key in sheet music. But what’s a key in the first place? We use the term ‘key’ simply to refer to the major or minor scale we are in. As you’ll see in the chart below, we have 12 major keys and 12 minor keys. Why 12? Because every note of the musical alphabet (all 12 of them!) gets its turn being the first note of a major scale and the first note of a minor scale. Each one of them is a key. For example, here is the scale of A major (meaning that it’s the major scale pattern starting on the note A). So with the term ‘key’ we’re simply talking about which scale is in use at any one moment. If the music changes key, then the scale has changed. If two songs are in the same key, it simply means that they’re using the same scale. So how do we know what is the key of a piece of music? For this, we look at the musical notation and see how the notes are organized. If there are any, we must take note of the sharps and flats too because these provide essential hints. Luckily, it’s really easy to find out what sharps or flats a piece is using because they’re normally written at the beginning of every stave (just after the clef). This is known as the key signature. The Key Signature is written on every stave just after the clef. There’s a neat pattern to how they key signatures progress. We start with C major that has no sharps, move on to a key with 1 sharp, then a key with 2 sharps and so on until we get to C sharp major which has all notes sharpened (so 7 sharps). The same occurs with the flat keys: every new key gets one more flat until we get to C flat major with 7 flats. There are several other patterns that you might notice but at this level, this should be enough for now. That second bullet point is VERY important before we move on to the next steps. Every key signature belongs to one major key and one minor key. This means that the key signature we find in sheet music narrows down our options to 2 possible keys: one major and one minor. Our next step will be to figure out which one of the two it is. Key signatures exist because major and minor scales must maintain the pattern of whole steps (also known as ‘tones’) and half steps (also known as ‘semitones’) no matter the note they begin on. The pattern of the major scale, for example, is: Tone, Tone, Semitone, Tone, Tone, Tone, Semitone. But if we start on any other note, we’ll have to make use of one or more sharps or flats. For example starting from the note D, the notes F sharp and C sharp (rather than F natural and C natural) are necessary to keep the proper pattern of tones and semitones. In other words, the key signature of D major is 2 sharps: F sharp and C sharp. Here’s another example. If we started from the note B flat and wanted a major scale, we’d find out that to maintain the correct pattern of tones and semitones, we’d need to flatten 2 notes: the B itself (becoming B flat) and E (becoming E flat). In other words, the key signature of B flat major is 2 flats: B flat and E flat. The same goes for minor scales. The sharps or flats are there to keep the correct pattern of tones and semitones. That pattern is where the scale gets its distinct sound – its particular quality. If we changed the pattern, we’d be changing the scale itself. OK so now that we can recognize the key signature of a piece, we’re left with deciding whether it’s representing the major scale or the minor scale. We learn why these chords are so important in this detailed lesson about ‘tonality’ but in general, it’s because together they establish the tonic in place as tonic. With practice, you’ll learn to see these notes and chords instantly in any key. Usually, the first note of the melody is either the first note of the scale (known as the tonic) or the fifth note of the scale (known as the dominant). The first chord in the music is very often the first chord of the scale (the tonic). If not, it’s the fifth chord of the scale (the dominant). The last chord is also usually the first chord of the scale. Look in particular to the bass. The first and/or the last notes of a piece are normally the tonic. When you suspect that the key is minor, look for the raised 7th in the music. ‘Raised 7th’ means that the 7th note of the scale is raised by one semitone. For example, in E minor look for D sharp in the music (that’s 7 notes up from E). Now let’s put these tips to the test! Here we have 4 short pieces for piano. We’ll begin with 2 simple bars from a Minuet by Bach. Is this a major or a minor key? The first two beats outline the notes of G major: G – B – D.
The notes in the 3rd beat of the first bar are D – F sharp – A. That’s the chord of D major (and it’s the dominant chord of G). The second bar consists of only notes from the G major chord. Even in such a small amount of music, the tips we learned about the tonic and dominant chords are in effect. 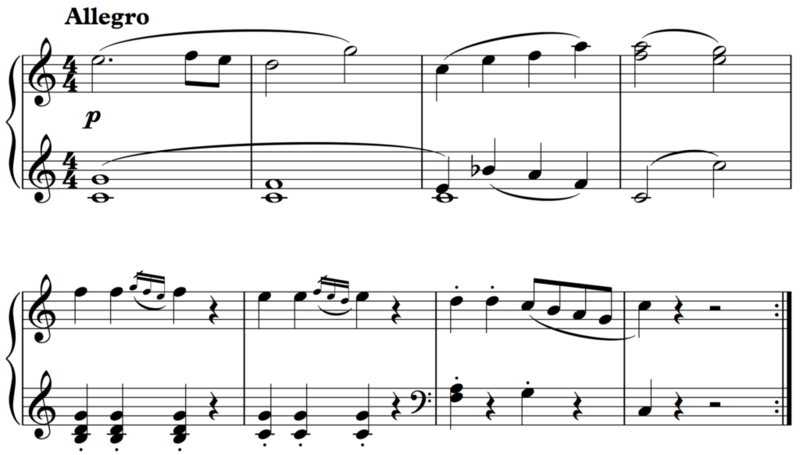 Next we have 8 bars from a short piano piece by Haydn. What’s the key? The first chord is C major with the note C itself in the bass. The last notes are two C’s – one in the bass and one in the treble. The bass note before that last C is its own fifth: G (note that the clef has changed to bass here). Ending with the fifth going to the first is a strong indicator of any key. The first phrase, finishing in bar 4, also ends on the chord C.
Here’s another extract. This one is from Schumann’s Album for the Young. 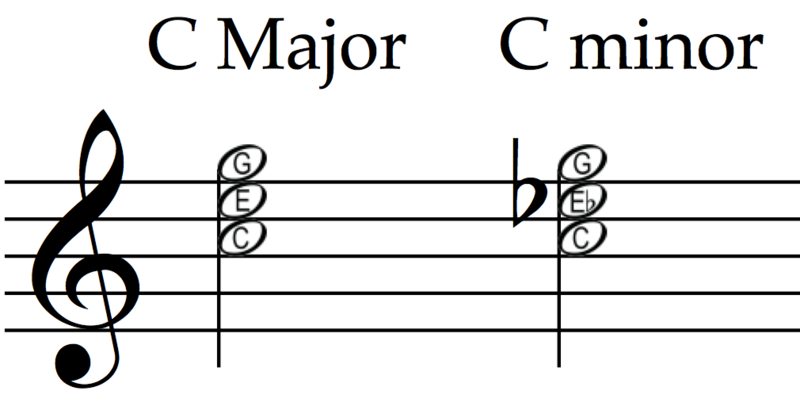 Is it major or minor? The upbeat is the note C which goes to F. That’s the five-to-one relationship once again! That’s because when F is the first note, C is the 5th. As we’ve seen, that alone already confirms F major. Even more so the melody goes from C to F another two times after that. In the 3rd bar we get the notes of F major spread out in arpeggio. The tonic, F major, leads to the dominant chord of F (that’s C major) in the 4th bar. Next we have the first 2 phrases from a short piece by Tchaikovsky. Is it major or minor? The first chord is C minor (the notes C – E flat – G) with the note C itself as the lowest note in the bass. The first phrase ends in bar 4 on C minor again and it’s preceded by the chord G (its dominant). The note B flat is raised by a semitone to become a B natural. This is exactly what we’d expect if we were in C minor – the 7th note raised. If we’re in C minor, the extract finishes on the dominant chord (G major). As we’ve seen already, that’s a perfectly normal chord for a musical phrase to finish on. Now what about that F sharp in the bass in bar 7? That note is not in the key of C minor so does it mean that we are wrong in our conclusion? No, we’re not wrong. Despite the F sharp, we’re still in C minor. This is a matter of harmony. Without getting into too much detail, the job of that F sharp there is to strengthen the push towards the destination chord of G major. The G major chord itself still belongs to our home key of C minor. So as you can see, the clues for whether a piece is major or minor are always in the notes. Look for the tonic and its dominant and you’ll know the key. Once again this is mostly a matter of practice. Now that doesn’t mean it’s going to take you years! It just means that you’ll need to go through some ear exercises for 15 to 30 minutes a day for a while. You might have heard that major is happy and minor is sad but this is an oversimplification. I understand this is not a popular opinion but describing intervals and scales with moods and feelings is misleading. It adds an unnecessary superficial layer to listening to music. Instead of getting distracted figuring out whether a scale is ‘happy’ or ‘sad’, we should listen to whether it is actually major or minor. Sounds are like colors. We know the color red simply as ‘red’ (without describing it as bright or dangerous or anything else) and the color blue simply as blue (without resorting to adjectives such as calm or wavy or whatever else). In the same way, there is a certain sound-quality (kind of like a sound-colour) to major and a certain sound-quality to minor and this is what we should practice to recognize by ear. Once you can do this fairly well, practice listening to the scales themselves. Play and sing major and minor scales on a keyboard and simply get used to their sounds. (The singing is important as it helps internalize the sounds and helps the ear greatly). Once again go to an online app such as teoria.com and quiz yourself on the scales. The goal is not to get it all right and leave the app as soon as possible. The aim is to immerse your ear in the sounds and become more and more familiar with them. It might take a few weeks or months but you’ll have the skill of telling between major and minor scales for life. Do you have any questions or comments? Let me know below or join our Facebook community over here. We’d love to have you over!